Need a friendly guide on finding ways to appreciate nature and how to go green? Get Out! is chockful of eco-friendly ideas to help families, classrooms, and groups get outside, learn about nature, experience the world in new ways, and take a hands-on approach to green living. Chapters on being an eco-friendly consumer and eco-friendly eater, as well as on choosing an issue and taking a stand, make for a well-rounded yet easy-to-use handbook for making a difference indoors and out. Open to any page to find something to do today. The payoff is huge: not only is nature just plain awesome to be in, research shows that spending time enjoying nature can actually improve our physical and emotional health. Bonus: Kids who learn to love nature will naturally do more to conserve it. Eureka! With Get Out!, green living is fun and easy. "Get Out! gives kids and grown-ups solid tips on how to understand and appreciate nature and its gifts. Our earth is the world's biggest classroom, and this book makes us want to keep it safe for generations to come." "This is a great book for getting families outside, having fun—immediately. Just reading a few of the quick, joyful suggestions makes you want to run out and collect rocks, build a birdhouse, and just appreciate the fact the planet is still doing its thing." "Everyone from the novice to the more environmentally aware parent or teacher will find new ideas to use right away." "What I love best about this book is that parents and children can learn together and take immediate action to make the world a better place." "Links the beauty and adventure of the great outdoors with talking, walking, exploring, and bonding with your kids." Judy Molland's pocket-sized book, Get Out! 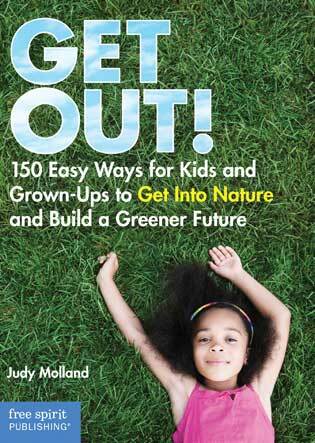 : 150 Easy Ways for Kids and Grown-Ups to Get Into Nature and Build a Greener Future, delivers on it promises. Every idea in this uncomplicated, refreshing book is easy to accomplish. It doesn't matter if you live in a city apartment, a suburban neighborhood, or out in the sticks - you will find dozens of doable activities adults can enjoy with children. The premise is, if you get kids to love and appreciate nature, they'll respect and protect it over a lifetime. Hurting the earth will be unthinkable. Even more, research shows nature contributes to emotional and physical health. Teachers, club leaders, and parents can all use these ideas to instill good stewardship principles in kids. These are great ideas for adults, too! Here are a few from the book: camp out in your backyard (#25); or, volunteer at a public park (#56). Idea #103 is a great one: arrange a toy swap with other parents. The ideas in Get Out! are fun, interesting, and motivating. And the earth wins. The author's friendly, chatty writing style makes for enjoyable reading, too. I have to commend Free Spirit publishing, and designer/photographer Tasha Kenyon, for this jewel of a book. It's beautiful. Plus, the small size and user-friendly organization make it quite handy. It's printed on recycled paper, of course. You knew that. The author is an award-winning teacher (high school Spanish), writer, and avid lover of the outdoors. Molland also authored Straight Talk about Schools Today. "The introduction to this book really struck a chord with me. I was one of those kids that "remember leaving home on a summer morning and not returning except for meals until bedtime." We were always outside - playing, exploring, making up games, riding bikes or skateboards, eating berries off the bushes - anything but hanging out inside. Outdoors was our comfort zone, but for kids today, it's being inside watching tv or playing video games. This is a great guide to help motivate kids and parents and encourage them to reconnect with nature. You'll find fun suggestions on ways to explore nature, experience the world, and make our environment a better place. This is a great book for families, classrooms or groups of all kinds. (Kids and parents)."